Clinical introduction A 69-year-old woman presented to the ED with a chief complaint of recurrent vomiting for 3 weeks. She was afebrile, blood pressure was 100/67 mm Hg, HR was 114/min, RR was 19/min and oxygen saturation was 98%. On physical examination, she had mild epigastric tenderness without guarding. Blood tests were normal except for hyponatraemia of 128 mmol/L and hypokalaemia of 2.7 mmol/L. The ECG demonstrated sinus tachycardia with first-degree atrioventricular block. 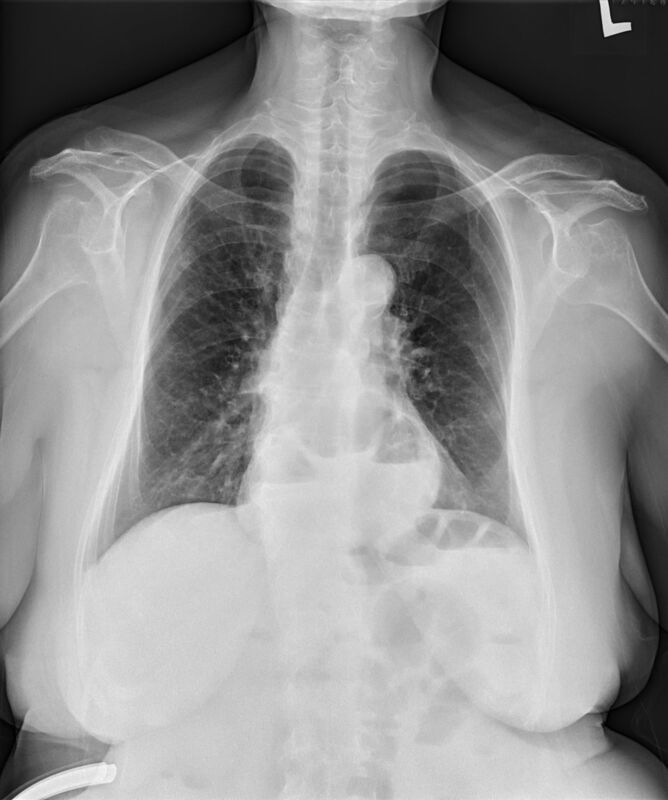 Chest radiograph posteroanterior view (CXR) was performed (figure 1). Chest radiograph posteroanterior view. The patient presented to the ED with a complaint of recurrent vomiting for 3 weeks. Question Due to continuous vomiting of this patient, which of the following is the most appropriate management? Contributors Y-KL reviewed the case and wrote the manuscript. C-LK contributed to the case and manuscript revision. C-WH contributed to manuscript review.